WIN A COPY OF CRAIG RUSSELL'S NEW 'LENNOX' NOVEL! It's been a while since I've run a Crime Watch giveaway, so I thought since Spring has finally sprung (here in New Zealand) this week, now seemed like a great time. Since my first ever competition had a Kiwi crime theme (I gave away books by Paul Cleave, Vanda Symon, and Andrea Jutson), the second an international theme (tickets to Lee Child), and the third a Kiwi theme (a copy of Alix Bosco's CUT & RUN), I thought that, turn-about, the fourth Crime Watch giveaway could take another turn with an 'international crime' prize. 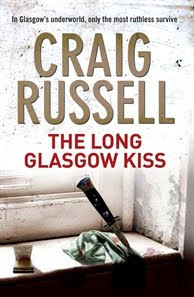 As such, thanks to the kind folks at Allen & Unwin, I'm giving away a brand new copy of the second book in Craig Russell's 1950s Glasgow-set 'Lennox' series, THE LONG GLASGOW KISS. This book has just been released in New Zealand and Australia this week. I've spoken about Russell and the first in the series, LENNOX, a bit on this blog, but given the giveaway question, I won't say anymore right now. This Crime Watch giveaway is available to anyone around the world, no matter where you live (I will ship the prize internationally). You may enter the draw by making a comment on this post, noting your full name and answering the giveaway question. The draw for the brand new copy of THE LONG GLASGOW KISS will be made at 5pm on Monday 13 September (NZT), so you have ten days to enter. What is one fact or piece of information about Craig Russell or his books? Hint: you can read my Weekend Herald feature on Russell and the first book in the Lennox series here, and my 9mm interview with Russell here. Russell sounds like an interesting person, being a police officer in between two stints in advertising. The Hamburg series sounds intriguing, especially because of the reference to mythology. Enjoying your blog very much. Here's one fact about Craig Russell - he has been shortlisted for the CWA Duncan Lawrie Gold Dagger. ....and another fact - Craig Russell was awarded the Polizeistern by the Hamburg Police! Craig I do hope to read some Russell's books soon. Meanwhile Russell considers from all his books that Lennox was the most fun to write. Both of Russell's series are set in interesting locales. I am particularly interested in the Scottish setting, and the 50s is always an interesting time. I haven't read any of the LENNOX series, but here is something I wrote some time ago: The setting of BROTHER GRIMM is very Germanic. I don't think I will ever look at Grimm's fairy tales in quite the same way again. It helps if the reader has a passing knowledge of the best-known of them. My name is Judi Maxwell and my address is 23 SE 47th Ave, Portland, OR 97215, USA. Mr. Russell is a Scot and a former policeman. Craig Russell's Hamburg series is excellent and worth seeking out. here's an interesting fact about Craig Russell and his books: Craig Russell loves Canada which is why LENNOX is half-canadian. Russell is Scottish and a former policeman, which should make him an excellent crime writer. Looking forward to reading his books. His novels are translated into twenty-three languages worldwide. Craig Russell is a Scotsman writing stories set in Germany. In 2007 Russell was awarded the highly prestigious Polizeistern (Police Star) by the Polizei Hamburg, the only non-German ever to receive this award. He has also won the CWA Dagger in the Library, and been shortlisted for the CWA Duncan Lawrie Gold Dagger. His highly-successful Fabel books will soon be made into TV movies by Germany’s state broadcaster. Russell was once accused by a newspaper of being a German writer using a British pseudonym. Craig Russell writes noir fiction set in Germany. HE has always been drawn to short stories and was fascinated with adventure fiction, i.e., Robert Louis Stevenson. I would definitely like to win his book! Interesting, when writing a Lennox novel he listens to Mel Torme. Please enter me into your contest.